Lauren Ward is one motivating force! She is a 4-year breast cancer survivor, a BCRC client, a 3-year Art Bra® Artist, and this year an Art Bra Model! She also serves as a consultant in business development, strategy and marketing, and has held roles across multiple industries, nonprofits, and top public institutions. 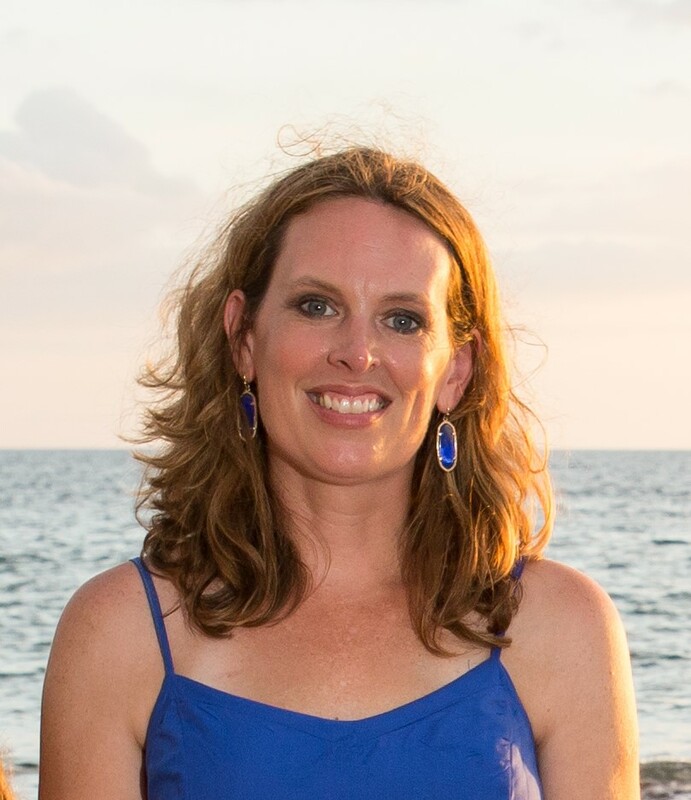 After successfully battling Stage 3 breast cancer, Lauren started an internationally recognized blog (mommyunlocked.com), and was named the first Alumni Ambassador to the Duke Cancer Institute after founding the Blue Devils vs. Cancer alumni organization. Lauren loves bringing together the different sides of her personality when she is creating something. She also enjoys stretching herself as designer. She believes a person is not limited by their abilities or by what they know because they can always learn more. And, using this belief, she hopes to continue to inspire her children to always find time to create and give back. In past years, Lauren has found herself drawn to contemporary art – minimalistic, but natural. “The cranes just seemed like such a beautiful representation of what we have gone through as a family – what we go through as a community … and if I could have a world with no more cancer through wishing, I would do all in my power to make that true.” Intrigued by this legend, Lauren decided this would be the inspiration behind her art bra design, which as a breast cancer survivor, she would model herself while strutting down the Art Bra Austin runway. The first step in Lauren’s design process – learn how to fold a paper crane! And, fold cranes she did. After the first 100 or so paper cranes, she explains it got a little easier! To form the skirt, Lauren created strings of 35 cranes by hand threading each crane onto embroidery thread. The number of cranes on each string was determined by the length of a “skirt” that was appropriate and dramatic enough for a runway reveal. After finishing the skirt, Lauren fabricated a silk corset using the pattern and skills she learned from designing last year’s art bra. She researched origami and discovered the quilting method that is now employed on the bodice – creating multiple square pieces of paper origami that are then sewed onto the bodice. To complete the look, Lauren hand-colored a belt, sewed individual crane lengths onto the belt, and came back through and covered the belt with origami paper. 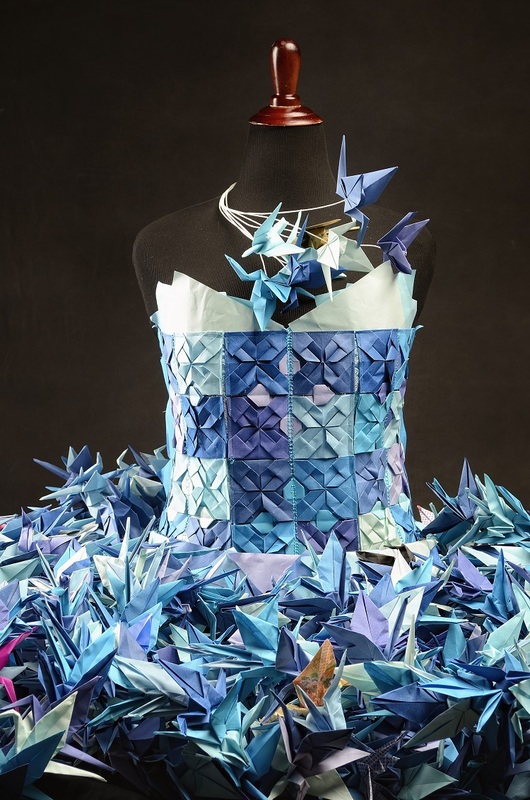 The entire ensemble is made up of – you guessed it – 1,000 origami cranes! “Senbazuru: 1000 Cranes” is one of this year’s most dramatic art bras and we’re honored to showcase its magnificence at this year’s show! !